Kevin Barth, who earned his B.S. 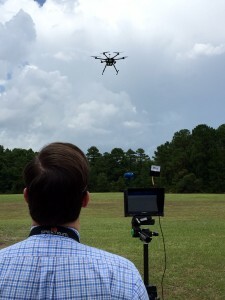 in Aviation Management and Flight Operations from Jacksonville University in 2014 and is completing work on a Master in Public Policy and Master in Business Administration, co-founded Aeritek, a Jacksonville-based aerial imaging company that operates small, unmanned aircraft systems (sUAS, a.k.a. drones) for commercial purposes within the National Airspace System. 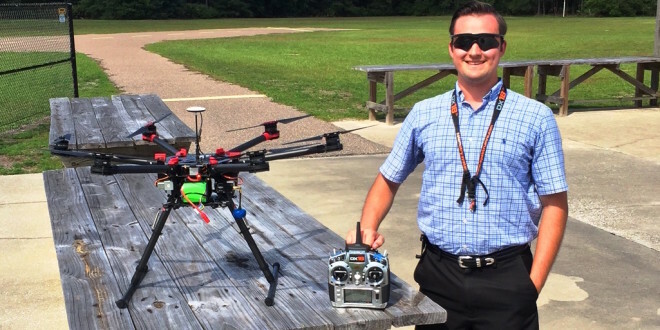 Throughout the last school year, Barth said he focused his course projects and research efforts on the rapidly emerging commercial sUAS industry. Those many hours of research, coupled with faculty mentorship and knowledge gained from his undergraduate degree from the School of Aviation in the Davis College of Business, enabled him to write a request to the Federal Aviation Administration for a Section 333 Exemption, as well as produce an operation manual, he said. By earning the exemption this summer, Aeritek is taking steps to ensure the company is leading the way in this emerging industry in the Northeast Florida region. Barth predicts that within the next decade, small drones weighing less than 50 pounds will be a very common sight, as companies like Amazon continue to develop and test package delivery systems. “Aeritek’s mission is to provide clients with accurate aerial imaging solutions that are obtained through the safe and legal use of drones,” Grant Ward, President of Aeritek, added in a company news release. “This exemption from the FAA will help us achieve that mission and continue to expand throughout the region.” Aerial imagery captures a unique perspective, most notably giving clients the visual scope of an entire property that include detailed views of a given location. The clear, crisp, aerial images afforded by drones have wide application, including use in enhanced promotional and web-based materials, legal documents, property planning and presentation aid. Formed in 2014 by Ward and Barth, who is Vice President of Flight Operations, Aeritek plans to use its technology and expertise to create efficient and technical analyses and visuals for clients in the construction industry, precision agriculture and utility companies, as well as other industries and organizations. “The reliability, efficiency, precision, and cost effectiveness of drones are incredible, and companies are starting to realize the benefits companies like Aeritek, that have a federal exemption and are insured, can bring them,” Ward said. For more information on the FAA’s Section 333 Exemptions, click here. For more information about Aeritek, Aerial Imaging Technologies LLC, visit aeritek.com.